Where are homes most expensive around the world? Australia and Canada both get a lot of credit for extremely high housing prices, while countries like Ireland, Denmark, and Spain all saw very large home price levels during the 2000s. 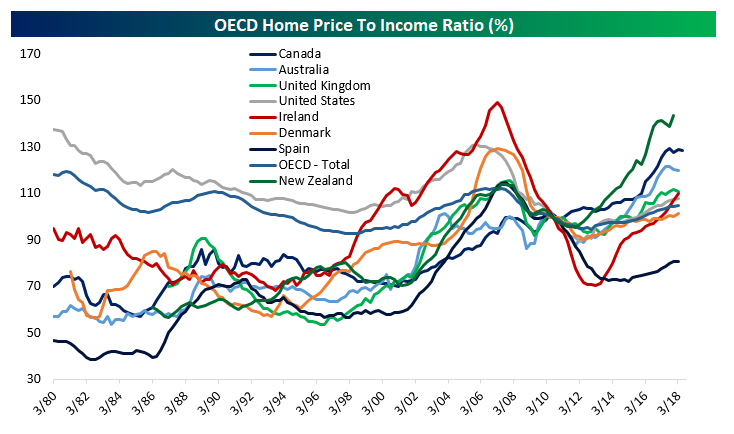 Overall, across the OECD, the current home price to income ratio is about 105% as-of Q1 2018. In other words, a home costs about the same as annual household income. By that measure, houses in Ireland went for 50% more than annual income at the peak of the last bubble while American home prices topped out at about 131% of income. By contrast, New Zealand is now the most expensive housing market with the latest OECD data (Q4 of last year), showing homes running 143% of income. That contrasts with the most recent data from the housing “bubble” in Canada (129% home price-to-income ratio in Q2 2018) and Australia (120% in Q1 2018). It’s no wonder that the government in New Zealand recently passed a bill to restrict foreign ownership of houses in the small economy, part of a broader effort to make sure homes stay affordable.